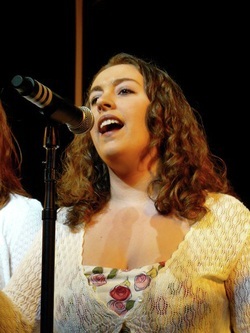 Jaimie is a vocalist, educator, music director and arranger from Danbury, CT. Jaimie began her career in music at a very early age, making her debut singing "Ba Ba Black Sheep," and "The Eensy Weensy Spider," at her aunts wedding. Since then she has performed extensively throughout New England. Jaimie's musical influences are a mix of Pop, Blues, R&B and Soul, but her true passion is musical theater. She has performed in, or music directed over 20 musicals in her career. Jaimie's dream has always been to teach. She is a licensed music educator in Massachusetts and Connecticut and a graduate of Berklee College of Music. While at Berklee she majored in Music Education and Contemporary Writing and Production. Jaimie currently works as a music teacher for Bridgewater-Raynham Regional Schools teaching general music and running the choral program. She also teaches for Berklee College of Music's Day Sessions and City Music programs teaching voice, A Capella ensembles and songwriting. She is currently accepting new students for private voice and piano lessons in the Quincy/Braintree/Milton, MA area. Please join my email list for updates on upcoming performances!